An excellent industrial water hose for larger tasks with a burst strength of 500 PSI from the IndustrialPRO series is proven to achieve maximum results. An incredibly versatile 75-foot industrial garden water hose for small or large jobs. The patented Hose Armour™ allows for easier weaving or wrapping around obstacles and equipment. The Goodyear MAXLite™ 50' 5/8" Premium Rubber+™ Hose is designed with an exclusive rubber formulation that makes it 40% lighter and 2X stronger than traditional rubber hoses. It's equipped to handle demanding commercial applications with a burst strength of over 400 PSI. Built to last, this 50' 3/4" heavy-duty hose provides 20% more water flow than standard 5/8” hoses. 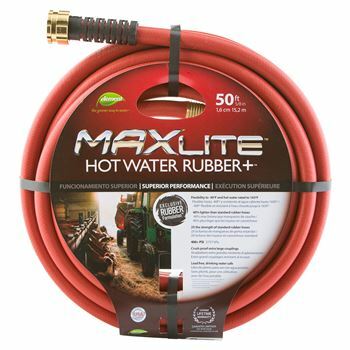 The MAXLite™ Premium Rubber+™ Hose boasts an impressive temperature range that allows it to remain flexible at -40° F and is hot water rated up to 165° F. With a burst strength of over 400 PSI, this long hose is suitable for commercial applications and can be used under extreme weather conditions. The 100 ft MAXLite™ Premium Rubber+™ Hose boasts a temperature range of -40° F up to 165° F. With a burst strength of over 400 PSI, this hose is suitable for commercial applications and can be used under extreme weather conditions. Designed to last, this hose comes equipped with large crush proof aluminum couplings at both ends for years of reliable performance. The MAXLite™ 25' 5/8" Hot Water Rubber+™ Hose is great for hot water jobs both big and small. It features a temperature range of -40 F up to 165 F, allowing the hose to remain both flexible and durable in just about any type of weather condition. The MAXLite™ 25' 5/8" Premium Black Rubber+™ Hose is built to last. With its crush-proof aluminum couplings at both ends, it is designed specifically for years of reliable performance. The hose boasts an impressive temperature range that allows it to remain flexible all the way down to -40° F and is hot water rated up to 165° F. With a burst strength of over 400 PSI, this heavy-duty hose is suitable for commercial applications and can be used under extreme weather conditions. The MAXLite™ 50' 3/4" Hot Water Rubber+™ Hose is hot water rated up to 165° F and can handle temperatures down to -40° F while remaining flexible and light, and easy to handle. Its larger diameter delivers up to 20% more water than a standard 5/8” hose. The MAXLite™ 50' 5/8" Hot Water Rubber+™ Hose is great for hot water jobs both big and small. It’s designed with a special compound that makes it 40% lighter and 2X stronger than conventional rubber hoses. With a temperature range of -40° F up to 165° F, the MAXLite™ Hose is equipped to handle the most demanding of commercial jobs while remaining flexible and light in extreme weather conditions. Our industrial garden hoses are specifically designed for applications with high exposure to wear and tear. Miracle-Gro ULTRALite premium heavy-duty hoses with 400 PSI burst strength are extremely lightweight and compact with additional reinforcement in the areas that experience high pressure. Another feature that makes these hoses very popular is that they are made of a proprietary compound that prevents kinks and also makes them easy to uncoil. Element IndustrialPRO and Scotts MaxFLEX industrial water hoses both have a 500 PSI burst resistance and are made to perform the toughest tasks. They are constructed of durable materials and reinforced against the risk of being damaged by garden equipment and exposure to potentially harmful conditions. The large grip-sized aluminum couplings not only make it easier to connect the hose to the source without tools, but are also designed to perform for a lifetime.